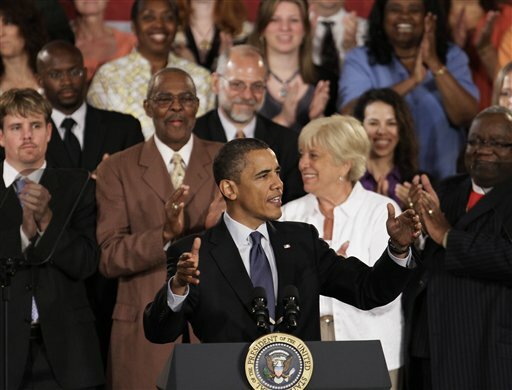 I certainly never thought that our city of Racine, WI would be a place our president would care about. Well, he must, because he came here today! He held a town hall meeting downtown at Memorial Hall, which I wrote about in this post. It is one of the most beautiful buildings in the city, it was perfect for this occasion. In a cool surprise, the motorcade first stopped at Racine's Danish bakery, O&H. 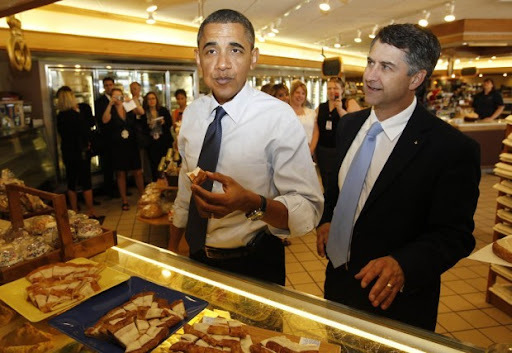 Obama wanted to pick up some famous Danish Kringle for his daughters, he also sampled some and spoke with the employees. I love this picture, how funny! He think he liked it. Nobody is really sure why he chose our city for a town hall meeting. I can only imagine it is because our unemployment rate is over 14%, well over the national average. He wanted to speak about jobs and the economy, but most people were so starstruck by his presence that I'm not sure anyone cared what he said. There was a line a mile long to secure tickets to the speech, some people had camped out since 10pm Monday! I was certainly glad when everything was over, during lunchtime there were police everywhere and many streets were blocked to accommodate the motorcade. It was a very exciting day for our city, though! Wow! That is exciting. 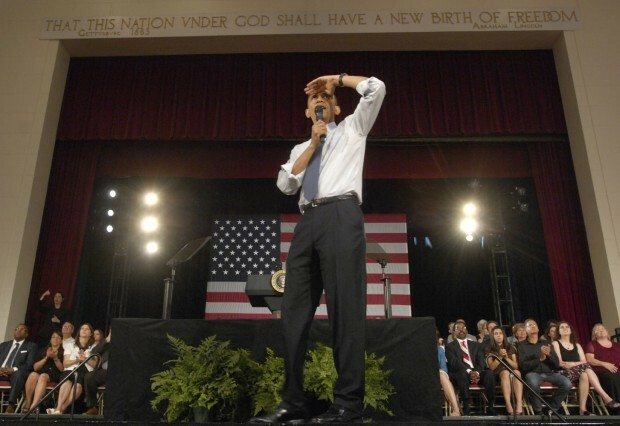 The President came to Baltimore once to speak while he was campaigning. It was a free event at a local arena. Me and some friends ducked outta work to check it out but somehow he was delayed and bla bla bla.... never saw him. that is so cool!!!! Obama recently came to the Bay Area (not Oakland though, pooooooh), but he went down to Fremont (I think) to check out some of the solar plants we have. That is very cool. I truly think our president cares about little towns like ours. And when he has come to Iowa, he always stops at little cafes and bakeries to bring back something for the girls. I think he's a pretty cool guy, which is a funny thing to say about the President, but I mean it! Cool! 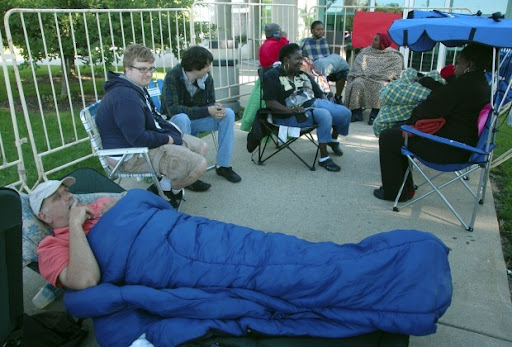 I'm from a tiny state (Delaware) and we were thrilled that Obama visited during his campaign. Of course, this is before he chose Delaware's own Joe Biden as a running mate. Now that the VP is from the First State, we know we'll never be forgotten again! How cool is that! We love Obama! I was shocked to hear that the unemployment rate in Racine is 14%. I hope the President, the Congress, everyone can pull things together so it gets better soon. And having been tangled up by G. W. Bush's motorcades a couple of times, I can say that Presidential visits really aren't any fun for bystanders.